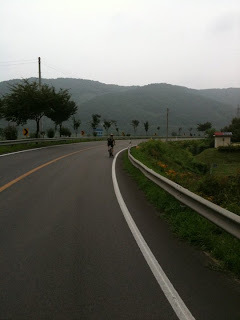 One of the first lovely roads that we would hit was the 403, just north of Chuncheon. The small road wound its way through farmland and along a stream, and there was very little traffic. The joyful realization that we were hitting the road was fully recognized, and Gravy and I were in high spirits. But the 403 began to rise, and directly ahead of us were mountains. We realized that there would be no circumnavigation of these mountains, as the grade began to steepen and the switchbacks began. Before long, I was off the bicycle, limping and pushing my beastly cargo up a hill. Gravy, who was significantly lighter packed than myself, was still pedaling up the monster, but that too would soon stop. At one point, about 30 minutes in, the road sign indicated...; no, boasted, that the grade was now 13%. After seeing this, I pushed my heap past a snake, dead on the road, having died presumably from trying to climb this wretched mountain. Then there was a sign saying that the top was 2 km away. Now, 2 km usually isn't much. But when every step you are taking is up a 13% grade, and you are carrying, among other things, at least 1000 pages of written word in your bulging panniers, then each meter is a monumental feat. Now, multiply that by 2000 and you get the idea. Everything that goes up must come down, and with cycling this is a very, very, good thing. Usually every climb is rewarded with a generous recompense of downhill riding, which usually triggers immediate amnesia to the struggle that came just before. But this particular hill was so nefariously steep that going down was almost as hard as going up. We had to ride the brakes hard, until the muscles in my hands were screaming. To add to this, they were also profusely sweating. In the event that my hand slipped off the brake, it may just be sufficient enough time for the gravity of the 13% grade to propel myself and my preposterously loaded bicycle right off the mountainside. After making it down safely, we rode into the city of Hwacheon, and had lunch by the river- a veritable feast of string cheese, beef jerky, corn on the cob, and lemon ginger cookies. I figured the more I ate, the more weight I would lose in the awesome parallel universe of cycle touring. After lunch, we picked up a pair of expensive cheap sunglasses (15,000 Won) for Gravy, and hit the road, the summer sun beating down fierce in the early afternoon. We were cruising along this path along the Bukhan-gang (North Han River) that went for miles and miles, and the heat forced us off the bicycles and into the water in the first of what would become the daily swimming ritual. The swim was like a baptism, a sloughing off of sweat and toil and entering into a new pact, a new covenant, with creation. All of the day's difficulties up to this point only make the water that much cooler and that much sweeter, and the experience that much more profound. And that is the crux of the bicycle trip. It's a microcosm of life. Moments of misery and suffering juxtaposed by the sweetest redemption of rising beauty and playful joy. It's a real live reminder of God's promise of redemption- to take the worst of life and to make it good, no, great! Better than we could possibly fathom. Beauty is only there after the testing fires of life. On the bicycle, this happens multiple times throughout one day. In one moment you may be struggling up a hill, rivulets of sweat stinging your eyes, wind in your face, cars screaming by, shotgunning you with exhaust. The next moment you're flying down a mountain, taking in layer upon rich layer of green mountains adorning billowing clouds like a deep jungle forest. The sweat is dried by a refreshing wind, and even cars fall behind as the country side welcomes you to its bosom, whispering its ancient melodies into your ears. And later, when trying to convey this with Gravy, we realize that no words are needed, the communication becomes extremely high context, written in the crinkles of smiles and satisfied sighs- the bliss of just being out there and on bicycles!